The first time we visit San Isidro in the Guatemala highlands – one of the most marginalized and isolated communities in Comitancillo – it is to meet the Community Development Committee to better understand their needs for new school classrooms. We meet in an adobe room with a dirt floor. We understand. The second time we visit is with Canadian dentists and optometrists and volunteers who have not only come to provide services to the community but who have also raised funds toward new classroom construction. The third time we visit is with Alberta teachers working alongside and supporting indigenous Guatemalan teachers with strategies to improve student learning outcomes. And on our most recent visit, just last week, we witness the progress made at this community school through the combination of the support of visiting volunteers, generous Development Dinner contributions, and Change for Children supporters. 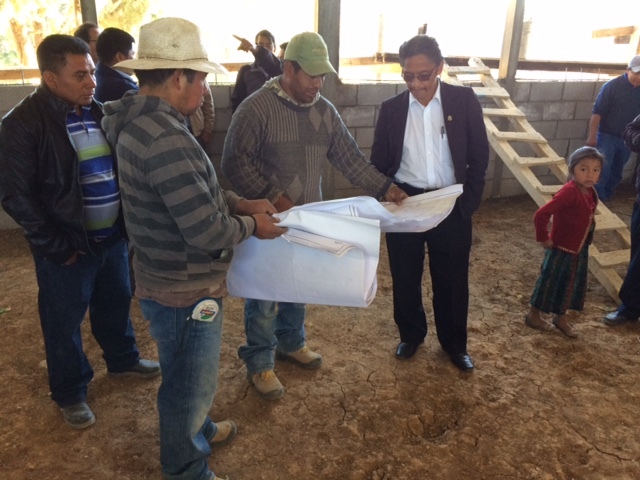 Two new classrooms are under construction and slated for completion in the next two weeks, well ahead of schedule! One of the new classrooms will be a computer room – equipped with technology as part of the Technology for Improved Education project in partnership with 60 million girls. The other will be used for prekinder kids experiencing school for the very first time. The organized and active Community Development Committee in San Isidro has been working hard to improve conditions in their community – from advocating at the municipal government level for a new junior high school, to providing all of the unskilled manual labour for the current classroom construction, San Isidro is actively investing in the future of this little village in the big hills of Guatemala. We look forward to our next visit to San Isidro in the summer when Alberta Teachers will engage with new students in new seats in the brand new space!